What I don't like about vacations is the "after" vacation mode that I usually experience. It's back to reality time. There are tons of things to do that it is overwhelming me. My son's summer classes have started and he is still "apartment-less". Oh I have paid the deposit and advance on the apartment but the landlord still needs to check the just-vacated unit to see if there are any repairs to be done. In the meantime, my son is crashing in with a classmate. The house is still a mess because of empty suitcases that need to be stored, clothes and stuff that need to be sorted and a million and one things including getting free insurance quotes for the car that is due for registration this month. D2 is busily sorting out the Coron, Palawan pictures. I saw that she has been filing the pictures under day 1 part 1 sort of thing. 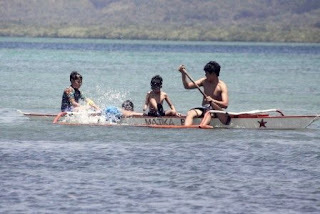 Below is a picture of my son and Ethan with two of his little "uncles" as they try to paddle off the island. When I saw them, I almost fell-off the hammock that I was in. The boys were several meters away from the shoreline, in deep water. Well, deep for the 3 little boys anyway. I would have not been so concerned if they were in life vests. 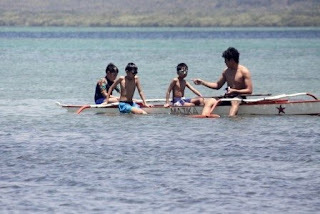 When I saw one of the little uncles try to get off the boat to paddle with his feet, that was it! Back to the shore! You guys are crazy!